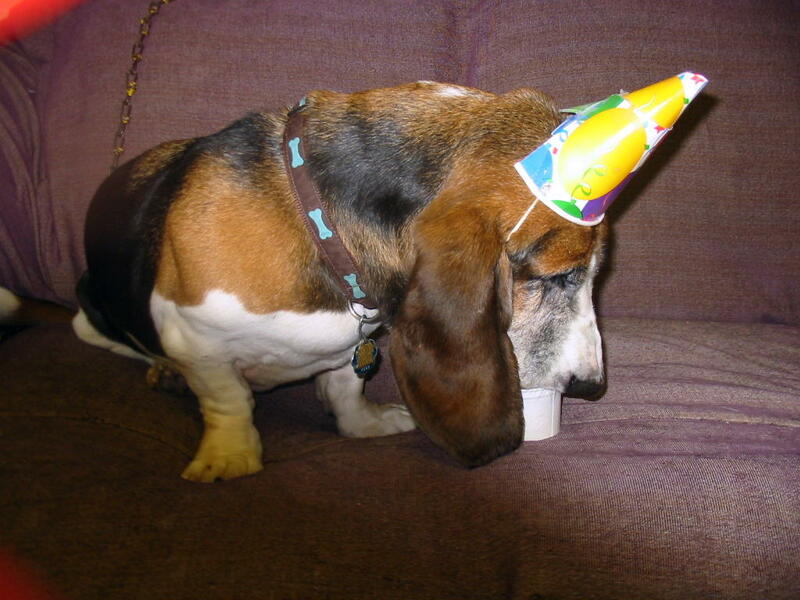 Baxter celebrated his birthday on his own terms. 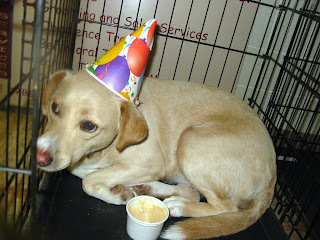 When he saw us coming with a party hat and a treat he high tailed it to the back of a crate. When we tried to coax him out, he replied with a warning growl. So we gave him his treat and sang to him. He was suspicious of the treat at first, but eventually he ate it. Okay, it's the holidays. Christmas cookies, potato latkes, fruit cakes, punch bowls, chocolate Santas or Chanukah gelt... whatever your tradition, it probably involves culinary treats. So this is the time of the year to remind everyone: PEOPLE TREATS ARE BAD FOR DOGS!!! This is true almost without exception. 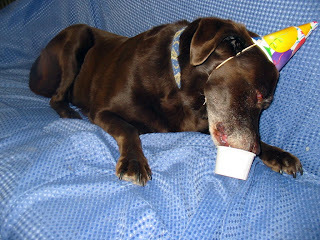 Chocolate is downright toxic to dogs and the other stuff can make them ill in varying degrees. Alcohol is a disaster. It's not funny to watch Fido lap up the spiked eggnog. Really, it isn't. 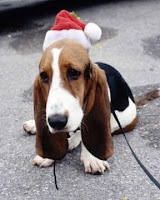 It could make him quite ill. And, dogs don't digest oily latkes or shortening rich fruitcakes very well. Mostly, what comes in goes out, and canine innerds suffer as a result of trying to process it. I run a daycare, and not a year goes by that the holidays don't bring horrendous diarrhea to my lovely, clean store. Yes, we have an outdoor yard. Ever tried getting diarrhea off snow and ice?? It's not a pretty task. And the pups don't feel that good either. They drink water and lie around looking perplexed that their body should betray them so. So please, control yourself and discipline your kids so the dog doesn't get treats other than those meant for dogs. There are losts of holiday versions of dog treats for sale out there in Walmart, Pet Source, Target, your local supermarket or your local pet store. Take advantage and make sure your family understands whose treats are whose! And what about dress up?? By all means! Hats, suits, collars, boots, it's all cute. 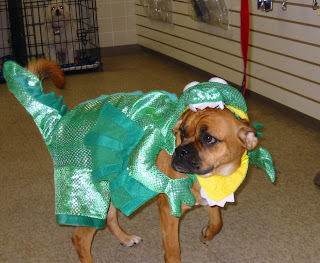 just remember DOGS IN COSTUME MUST BE SUPERVISED. At all times. Left alone, they may very well decide to treat the adorable dreidel coat or reindeer antlers as toys... which means chew baby chew! And dog clothes are not safe for eating. I can't count the number of times I've looked on in sympathy while some poor four-legged tried to poop out yesterday's antlers. Gabe loves his birthday treat. Doesn't even mind the party hat 'cause he's totally focused. Brother Sam lies nearby trying very hard not to look over to stare at Gabe's bounty! Who says pit bulls don't play nice? Watch Dexter as the new kid on the block. This was his interview and he played beautifully with Shuki the sheltie, Benny the cocker, and Livvy the lhasa. 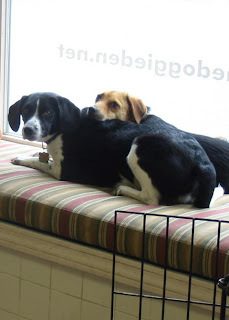 Cuba the black and white wolfhound mix is new to The Doggie Den family. Watch her get off on the right foot by keeping Zack the golden retriever and Lenny the German shepherd in line. A girl has to take care of herself! Floyd the friendly basset turned 11 today! He's our official senior pup though he doesn't act like it. He watches from the couch until he sees something he wants to participate in, then he jumps down and barks his deep WOOF! 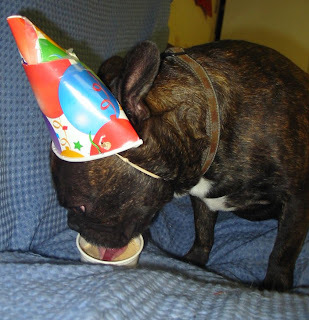 He loved his treat - wasn't even aware of the party hat. He has very clear priorities: FOOD, FUN, SLEEP pretty much in that order. 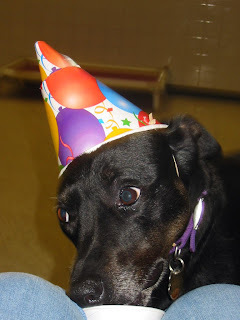 Ezri turned 5 today and boy does he not like his party hat. He did eat his peanut butter treat but only after we took the hat off. 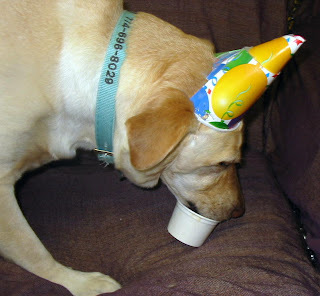 He was also a perfect gentleman: he let his brother Atrayu (see his birthday pic on Fri. Aug. 14, 2009) share his treat. What a good boy. Maya is another one who hated the hat, so we took it off and she dove into her treat with gusto. She turned 3 today. She's really a big dog but she prefers to play with the medium sized dogs because she can boss them around - not that they listen! We each need our 15 seconds of fame, but everyone else gets in the way. So we just push'em aside and work our own agenda. While Clancy the lab puppy watches with his blue bone, Atrayu the Icelandic Sheepdog wrestles with Noel the black lab mix. 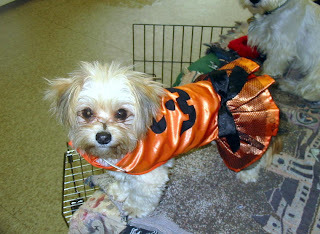 Is it possible that Halloween's just a memory and Thanksgiving is zooming toward us?? 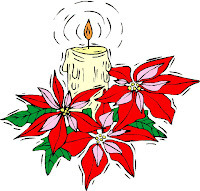 It's a wonderful season, full of friends and family and dogs and PARTIES! 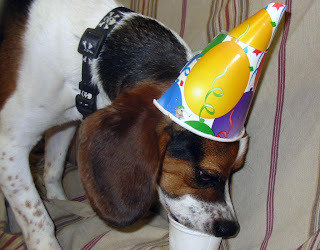 Dogs like to party too... but it's important to keep them away from people food and people drinks. At The Doggie Den. We get more upset tummies and GI tracts this time of year than any other time. This week we're going through the toxic chocolate (and other candy) syndrome. Unpleasant for the pups, for their owners and for us. Sudden changes in diet can cause GI tract upset, even if the change is to a healthy food. So feed your dog his/her regular dogfood or a vet-approved alternative diet! And have a happy woof! 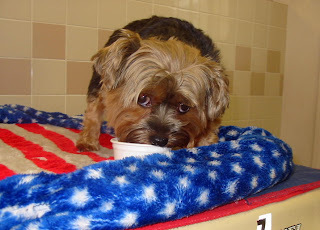 Belle is an adorable Yorkie with big brown eyes that let you know exactly what she wants. 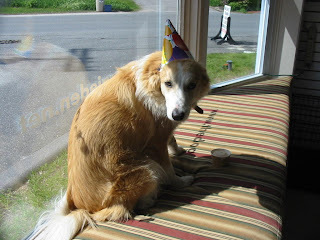 For example, she was having none of the birthday party hat thing. Not only the LOOK, but she also screamed her outrage. 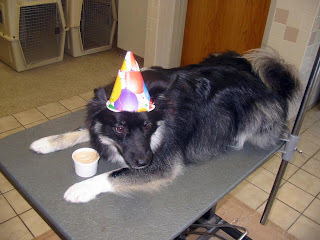 So I took off the hat, and sang "Happy Birthday" while she worked on her Frosty Paws treat; and she let me know I was finally getting it right. 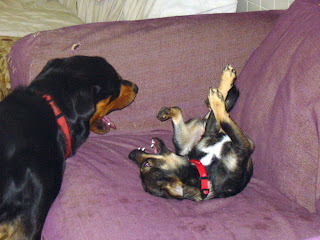 Belle recently acquired a Yorkie brother, Milo, and she willingly shared her treat with him. What's with this hat, Susan?? How'm I supposed to eat my treat? I'm a dog, we don't wear hats, ok? Susan... SUSAN. !! Right, that's better. Thought you'd never get it. What flavor is this, anyway? Peanut butter? Not bad. But next time, NO HATS. 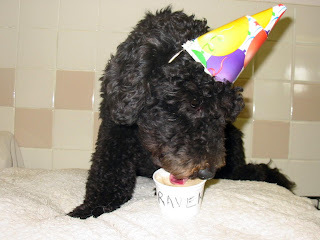 Raven turned 1 today! She was as sweet as can be with her peanut butter Frosty Paws treat. Meet Lady Bailey, The Doggie Den's perfect rottweiler. She sports all that the breed standard could desire plus a mega playful personality. She's still a youngster so she may slow down some day but we're beginning to doubt it! 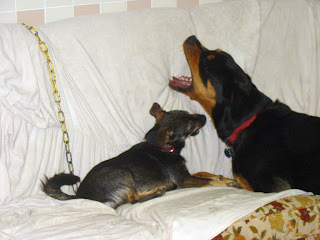 Below, Bailey is playing tug of war with Spike. 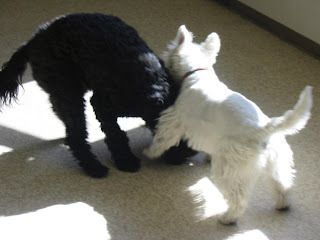 Spike is determined to win, but Bailey digs in her heels, even if she only has a tiny piece of the tug toy. She can't imagine that Spike could beat her! Meet Sam, our min pin mix. 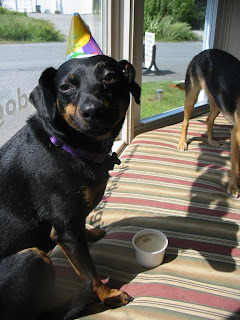 Like his brother Gabe (see our post dated January 14, 2009), Sammy loves the window seat and chose it to enjoy his peanut butter Frosty Paws. 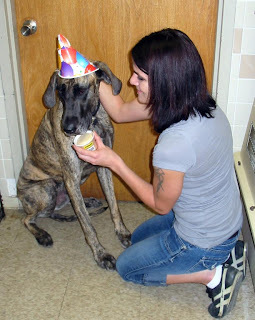 He actually turned 3 on August 11, but we overlooked him, so he got apologies and lots of hugs to make up for it. 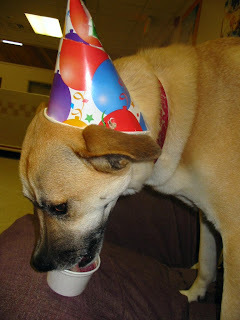 Sam loved his Frosty Paws (would NOT share) but he was not going to eat it wearing his party hat. Once we took the hat off, he tucked into his treat with gusto. Atrayu is one of a pair of Icelandic sheepdog brothers who are Doggie Den regulars. 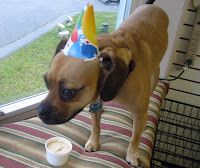 Today we sang happy birthday to celebrate his 3rd, and he reluctantly allowed the birthday hat routine in return for a delicious peanut butter Frosty Paws treat. You may be able to tell from the look in his eye that he was not sharing if he had to wear that stupid hat. Fair's fair. Meet Holly, one of our most rambunctious girls. She has a hunting dog's energy and will play non-stop. 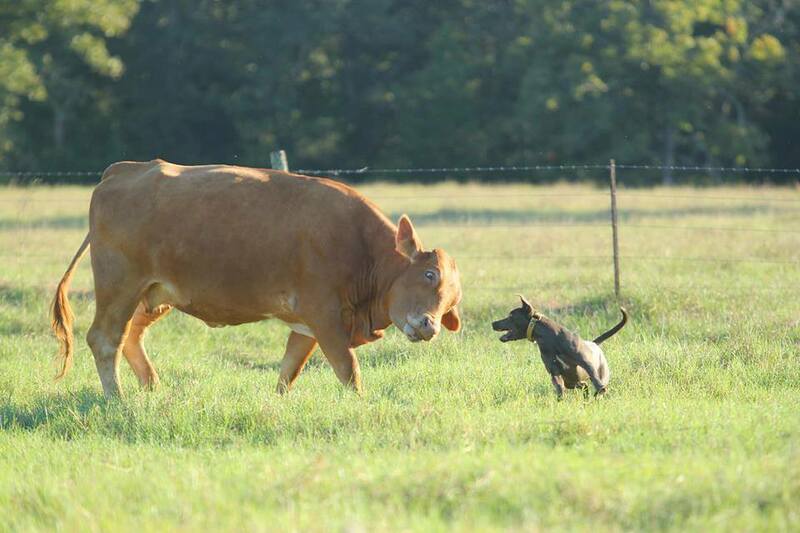 If anyone refuses to play with her - like if they walk away, she stands and barks vociferously! No is just not an acceptable answer. Sometimes when she lies down, we move to cuddle her thinking she's resting. On the contrary, our attention convinces her it's time to play some more! 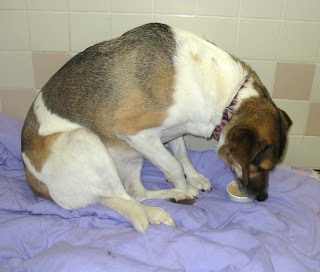 Holly was 3 years old this week and she enjoyed her peanut butter Frosty Paws immensely. Sharing was not on the agenda! Ebby is our coolest, calmest, most collected lab mix. She's socialable but kind of private. She'll only eat her lunch by herself, in a separate room, 'cause the competive commotion of other interested parties is beneath her. 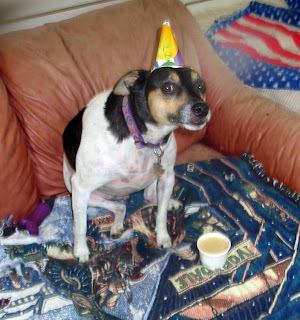 When we put Ebby's birthday hat on, she lost interest in her treat and gave us the look you see. "You want me to wear WHAT?" After the photo we took her hat off and she proceded to taste her Frosty Paws. She's a delicate eater, so there was some left for her chocolate lab mix friend, Fern. Fern was most appreciative. 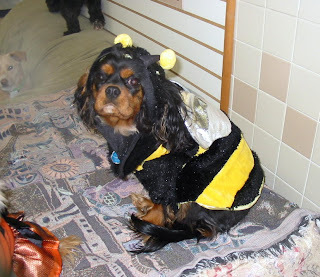 An article by Eve Adamson, reprinted from The American Kennel Club's Family Dog magazine. Summer means tick season when those bloated little arthropod vampires get warm and hungry and start feeding on cattle, wildlife, humans... and DOGS. But ticks aren't just disgusting, they're also dangerous. When ticks bite wild animals such a deer or squirrels, they take in the bacteria these animals may harbor and can pass them along to their next host. Some bacteria can cause diseases in dogs (and in people) - dangerous, debilitating, and sometimes even fatal diseases such as Lyme disease, ehrlichiosis, babesiosis and Rocky Mountain spotted fever. Precautions begin with keeping your dog well-groomed. Regular brushing, combing and bathing keep your dog's skin and coat strong and healthy. Ticks tend to prey on weak, dirty, sick animals with broken skin. A healthy, well-groomed dog is more attractive to us but less attractive to ticks, who prefer a dirty dog with a poor immune system for a host. To keep your dog's skin (and overall health) in even better shape, make sure s/he eats a balanced and high-quality diet, especially one containing esential fatty acids (EFA's) either in his/her food or as a supplement. EFA's help strengthen and improve skin and coat quality... . I definitely recommend using a tick control product on your dog. If you take your dog into woodsy areas often, a monthly spot-on product is a great choice... . Ask your veterinarian about the best and safest tick prevention products (...) because your vet will consider your dog's health, age, size, and also the risk of ticks where you live. Finally, keep your yard tick free (...). Keep woodpiles and brush piles far from the house and out of the fenced area where your dog plays. Keep your grass mowed short and trim the longer grass that grows along fences and around garden borders. If ticks don't have good, sheltered spots to hang out and await your dog's approach, they'll go somewhere more tick-friendly. (...) Prompt removal is essential because the longer a tick is attached to your dog, the greater the chances that it will transmit a disease. Most tick bites don't result in disease, but the chance that they could makes it important to remove the little blood suckers without delay. Every time you go into tall grass, shrubs, or wooded areas with your dog, do a tick check as soon as you get home. Work through your dog's coat with a fine-toothed steel fleas comb or, if your dog has a short coat, just use your hands to look and feel all over for suspicious bumps and creepy-crawlies. (...) look carefully in the areas ticks like to frequent, such as behind or inside ears, around the rear end under the tail, or on the chest and belly where there is less hair and the skin is easy to puncture. (...) grasp the tick as close as possible to where its head is attached to your dog. Pull straight up, not to the side. The tick may come all the way out, or it may leave its mouth parts behind. Don't worry if it does. Pull out whatever you can, then swab the area with disinfectant and dab on some antiobiotic cream. Your dog's body will eventually push out the foreign parts, but keep an eye on the area. 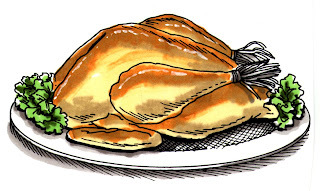 If it starts to look infected - red, swollen, filled with pus - give your veterinarian a call. We've had a busy week partying! 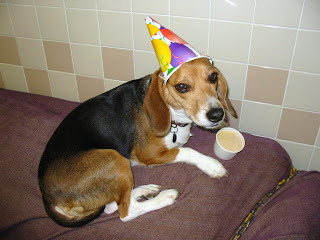 Lucy the chihuahua mix, Cody the labrador retriever and Houdini the beagle all had birthdays. As you can see, all three tucked into their Frosty Paws treats as though they hadn't eaten in weeks. Lucy only weighs a couple of pounds, but she made the contents of her dixie cup disappear in minutes. Her tongue must have been frozen. Houdini ate the treat then started in on the cup itself. Had to pick pieces out of his teeth! Fortunately we got to him before he swallowed any. 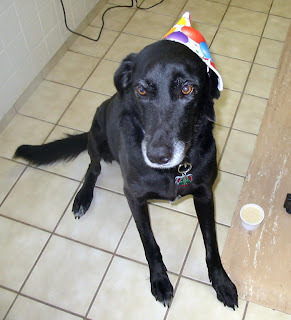 Olivia loves the whole birthday schtick: the hat, the singing, the attention, the treat. Even the having to warn fellow party hounds about poaching her treat! Her brother Simon had his birthday on April 13th (see post for that date). 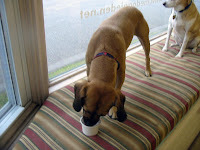 Olivia managed to respect his Frosty Paws cup that day, so today he did the same for her. He's right there, off-stage left but he's just staring hopefully. 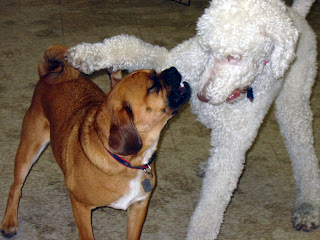 Olivia and Simon always come to The Doggie Den together, and sometimes they play with each other, but often they play with other dogs. We refer to Simon as "the old soul" since he has an ageless wisdom about him. Olivia is Miss Center Stage - always eager to be her humans' primary focus. She does share though. We think Simon taught her that. Fourth of July Festivities: Should You Bring Your Pet? As the country dons its red, white and blue to celebrate Independence Day, nothing says patriotism like a good old-fashioned barbecue with a side of fireworks. 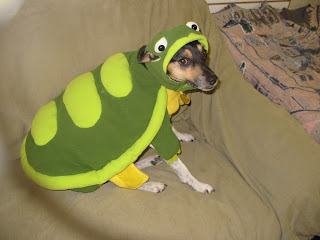 But beware dog parents, what's fun for people can be frightening and painful for our furry friends! The ASPCA recommends keeping your pooch indoors as much as possible during backyard parties and Fourth of July festivities, even if s/he is a pro picnicker. From toxic food and beverages to raucous guests and fireworks, the holiday weekend is a minefield of potential pet problems. "Even the most timid dog can leap a six-foot fence if he's spooked by loud noises," says Dr. Pamela Reid, Vice President of the ASPCA Animal Behavior Center. If your dog shows signs of distress from fireworks or boisterous revelers, Dr. Reid suggests giving him a Kong toy stuffed with peanut butter. "The persistent licking should calm his nerves," she says. - Keep your pet on the wagon. Since alcohol is potentially poisonous to pets, place all wine, beer and spirits well out of paws' way. - Avoid scraps from the grill. Stick with your pet's normal diet--any change, even for a day, can result in stomach upset. Certain foods like onions, avocado, chocolate, grapes and raisins are especially toxic to pets. - Skip the sunscreen. Avoid lathering your pet with any insect repellent or sunscreen not intended for the four-legged kind. Ingestion can result in drooling, vomiting, diarrhea, excessive thirst and lethargy. - Stay fire-smart. Keep your pet away from fireworks, matches, citronella candles and lighter fluid, which if eaten can irritate the stomach, lungs and central nervous system. - Be cool near the pool. Don't leave pets unsupervised around a pool or lake--not all dogs are expert swimmers! Also, pools aren't large water bowls--they contain chlorine and other toxic chemicals that can cause stomach problems. 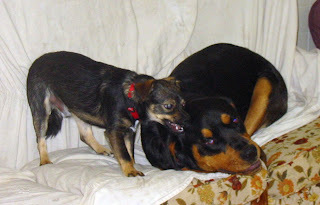 Little Mackie Mix and Big Bailey Rottweiler are The Doggie Den's best examples of "opposites attract". 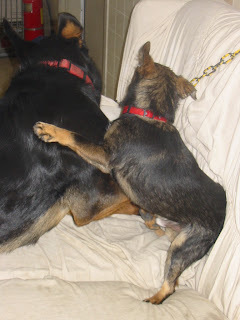 They LOVE to play together and have two basic strategies to compensate for the difference in their sizes. Either Bailey lies down and the floor and Mackie jumps all over him; or Mackie jumps up on the couch to be more at Bailey's level. 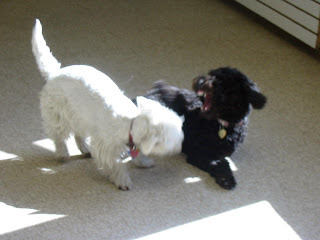 In the latter case, Bailey pushes Mack around with his head, while Mack bears his teeth with great bravado! and fall down exhausted at night! 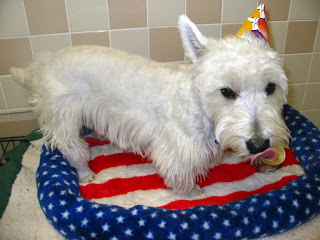 Okemo was 1 year old on May 1st and is he ever a handsome boy! He LOVES his windowseat even though it's getting pretty warm in the sun (we do have central AC). 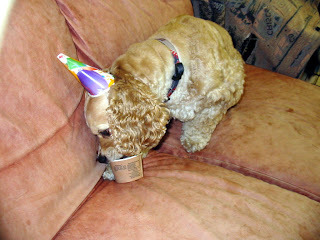 For his treat Okemo had a banana/peanut butter organic Yoghund - it's frozen yoghurt for dogs! He was a bit cautious with it. Maybe not a health food type guy? Benny, on the other hand, is a pig that barks. 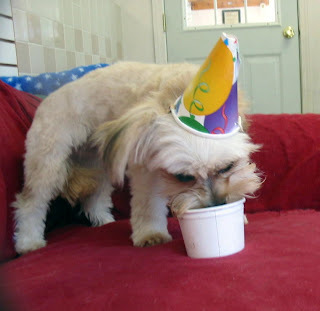 He hated his party hat, but that wasn't nearly as important as getting his Yoghund treat down his throat in record time! He would have eaten the cup if we'd let him. Benny is Susan's cocker spaniel, a rescue from Save A Dog in Sudbury. He was 6 years old on May 1st. 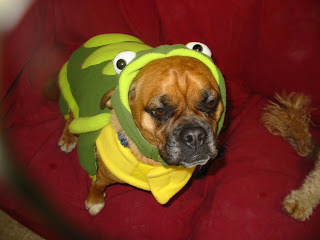 Crosby the puggle: Hey, watch it! 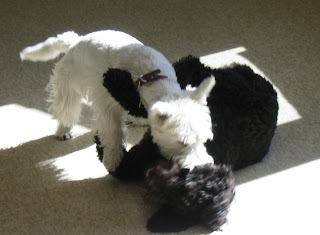 Lilly the standard poodle: Huh? Wha? Wanna play, cutie? Play now, yes? Crosby: What's with the arm action? 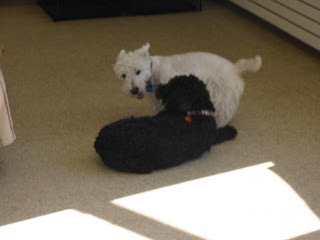 This is Louie's pal Elliot (see post dated Thurs. April 2nd). 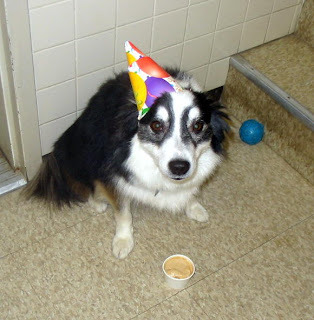 Elliot will be 9 years old on May 21st, but we goofed and gave him his party a month early. You can see Louie off to the left looking for his share of the birthday treat. And you know, Elliot never told us it's NEXT month, can you believe it? I suppose he expects us to do it again in May! Callie is two years old this week. She's one of four beagles who frequent our play groups, and she's a real sweetie. 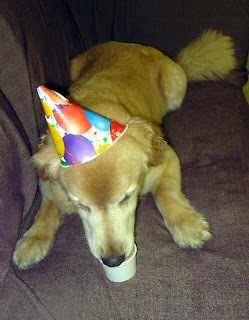 She posed for her birthday picture, then tucked into her Frosty Paws treat in no uncertain terms. We thought it very considerate of her to take care of the picture first. 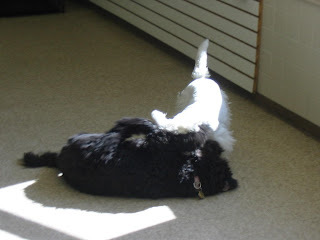 Callie likes to play with the big dogs even though she's more medium sized herself. 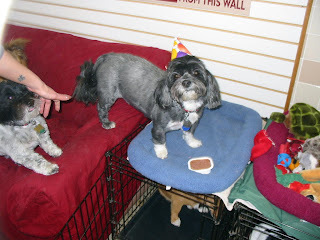 Louie turned 6 on April 15. He's best friends with Eliot (see April 2nd post) who, sadly, couldn't come to Louie's birthday. 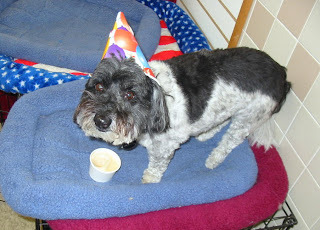 But Susan sang to him and he seemed quite content to enjoy his Frosty Paws dixie cup on top of a crate where he could keep any potential intruders at bay. Simon P. is one of a pair of Malteses at his house. You can check out his sister Samantha's birthday post on March 19th . 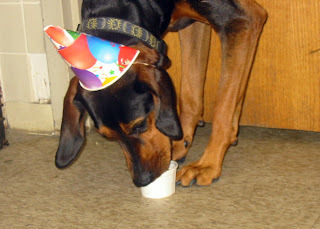 Simon was three on April 12th and he thoroughly enjoyed his birthday treat. Wouldn't look up for his photo - not even for a split second! 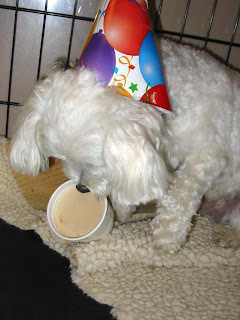 He licked it like crazy, and when his tongue got cold he carried the dixie cup into the back of a crate where it was safe for him to take a break!